Here’s how to properly store, handle, and prepare EXONDYS 51 prior to infusion. Once you receive EXONDYS 51 at your facility, be sure to store it according to proper procedures. Prepare the infusion pump and tubing as per the normal operating instructions for the make/model being used for the patient’s infusion. Assess the patient’s IV or port for patency prior to removing any vials from the refrigerator. If IV access is adequate, remove the appropriate number of vials from the refrigerator and allow them to warm to room temperature. Do not microwave vials. Once at room temperature, mix the contents of each vial by gently inverting 2 or 3 times. Do not shake. Visually inspect each vial of EXONDYS 51. EXONDYS 51 is a clear, colorless solution that may have some opalescence. Do not use the solution in vials if discolored or particulate matter is present and report the issue to Sarepta at 1-888-SAREPTA (1-888-727-3782). With a syringe fitted with a 21-gauge or smaller non-coring needle, withdraw the calculated volume of EXONDYS 51 from the appropriate number of vials. In order to avoid damage to the rubber stopper, the same needle should not be used to puncture more than 4 vials. Before adding the calculated volume of EXONDYS 51 to the saline bag, remove an equal volume of normal saline solution from the bag. Next, inject the bag with the syringe containing the calculated patient dose of EXONDYS 51. Gently invert infusion bag to ensure equal distribution of product. Avoid agitation during preparation. Contents can be mixed through 2-3 gentle inversions. Do not shake. Visually inspect the diluted solution for particulates. EXONDYS 51 contains no preservatives and should be administered immediately after a dilution. Complete infusion within 4 hours of dilution. If immediate use is not possible, the diluted product may be stored for up to 24 hours at 2°C to 8°C (36°F to 46°F). 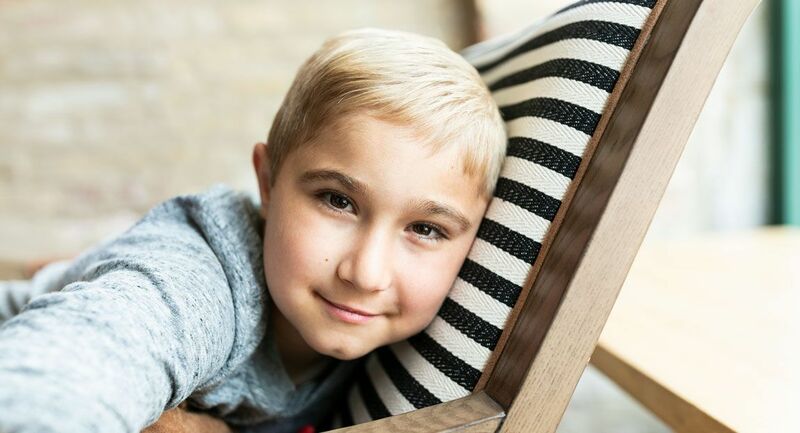 EXONDYS 51 is administered via intravenous infusion. Flush the patient’s intravenous access with sodium chloride 0.9% injection, USP, prior to and after infusion. 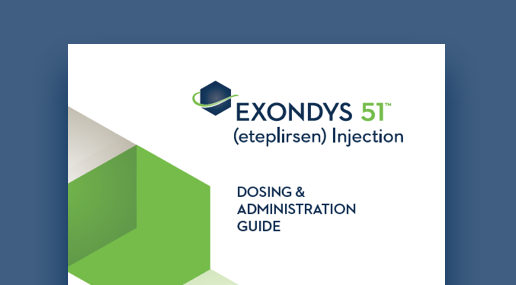 GET AN EXONDYS 51 DOSING AND ADMINISTRATION GUIDE. Please see full Prescribing Information for EXONDYS 51 (eteplirsen).